Have you signed up for Poshmark yet? Are you ready to start becoming one of those top sellers that you keep hearing so much about? You know… The ones who have sales non-stop and are able to comfortably supplement their income with their Poshmark sales. 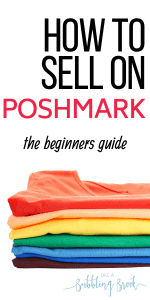 I’ve created this beginner’s guide to start selling on Poshmark to help you become one of these sellers. When I first started to look into selling on Poshmark, I discovered there are tons of sellers who make full-time living just reselling clothes on Poshmark! Now, I’m not here claiming that you are going to make a full time living, but if you follow these tips, you can become a successful seller. Are you ready to start your journey toward Poshmark Top Seller? 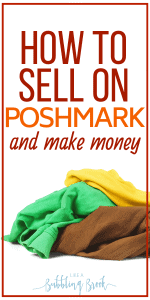 Let’s take a look at how to get started selling on Poshmark. Yes, I know that super basic and I shouldn’t have to tell you, but Poshmark is a mobile selling platform and it only makes sense that you would have the app downloaded onto your phone or device in order to sell on it. Poshmark is a good combination of sales platform and social media. People will follow you and you need to follow other people. The more people you have following you, the more people will see your sales ads. This is because you simply have more people viewing your stuff, but also because more people will share you stuff. That means that not only will your followers see your things, but the followers of whoever shares your ad will see it as well. This is key to successfully selling on Poshmark! This brings me to my next point. SHARE other listings. The more of other seller’s stuff you share, the more they are going to share your items. Poshmark depends highly on the sharing and teamwork environment that we have all come to know and love. 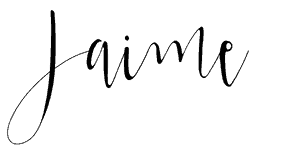 One more thing…comment. The more you comment, the more people will see your profile, therefore seeing your sale posts. See what I mean by social media? Speaking of social media, make sure to share your listings across your personal social media channels. I know some of you have lots of social media followers, so don’t be afraid to show off your post there. Sharing your posts like this brings a lot of eyes to your ad! In the sales world, photos and presentation are everything. This is also true for Poshmark. Photos are so very important here and you need to make sure that your photos are the best that they can be. Use natural light. Everything looks better in natural light. Everything. Use Poshmark’s photo tips and tools. They put them there for a reason and they really do help. Show the clothes on. Don’t worry about posting your face. Take a photo of yourself (or a friend who wants to model) inside the clothes so that the potential buyer can get an idea of what the clothes look like on. TIP: If you are serious about becoming a successful clothing reseller, you might consider investing in a mannequin or dress form (like this one; they’re surprisingly affordable!) to display and photograph your clothes so that the buyer can see the fit of the clothes a little better. Make a collage of photos. This is a great way to showcase several details about your item all at once. Here’s the thing, even if your item has a flaw or two, it still may sell with no issues. The only thing is that YOU MUST DISCLOSE THE FLAWS. This is for two reasons: 1) As long as you disclose the flaws, the buyer can’t back out of the sale or get a refund, and 2) You will earn your buyer’s trust with your honesty. This is so important when you’re selling on any platform, and especially important when you’re selling on Poshmark! As far as titles go, make sure to be as descriptive as possible. Lead with the name brand (example: NIKE Hoodie, or Silver Jeans), this helps shoppers find it during searches. Also, be sure to fill up your title line with as much information as possible. It’s good business to give potential buyers as much information as possible to help them make a quick purchase decision. Are you good at styling your clothes? If you know how each piece is going to look it’s best, don’t be afraid to put that in your ad, potential buyers will start to be able to visualize it a little better and be more likely to buy. I find that it is best to list high, but be willing to budge a little bit on your price. People love to negotiate and many people are far more likely to buy if they think they have gotten a great deal. That being said, don’t assume that you need to take low offers. Be firm in your decisions and don’t take less than you want or need for the item. You are not in this to lose money. You may not believe it, but people care how their items arrive to them. Take the time to package the items nicely. A good rule is to put the item of clothing into a gallon sized plastic bag before you place it into the shipping box or envelope. Some people also wrap the items in tissue paper to class it up a bit. This tissue paper has super fun designs on it. Yeah, I know it sounds cheesy, but it works! When packaging your item, include a small thank you gift with it. This can be a lollipop or piece of hard candy or maybe a thank you card. I know people who have bought a pack of 10 thank you cards from the dollar store and added them into each shipment, I also know people who have had THANK YOU printed nicely on business card to slide into purchases. You can seal the cards with these beautiful heart-shaped “thank you” stickers. Buyers love little things like this, and these extra touches can mean the difference between a great rating and a mediocre one! I wish you all the best success as you begin selling on Poshmark!